Doctors for Responsible Gun Ownership (DRGO) is a nationwide network of physicians, health professionals and others who support the safe and lawful use of firearms. The group was conceived in late 1993 by former director Timothy Wheeler, MD, a now retired southern California surgeon. By then organized medicine groups such as the American Medical Association and the American Academy of Pediatrics had joined with prominent medical journal editors to mount a culture war against gun owners under the guise of academic research. DRGO was intended to be a response to this loosely coordinated but powerful cultural assault on Second Amendment rights. In 1994 Dr. Wheeler, radiologist Robert Bridges, MD, and pharmacist specialist Stephen Wenger, PharmD (also a firearm instructor) met with a representative of the Claremont Institute, a conservative think tank in the Los Angeles area. These doctoral level health professionals, along with J. David Brayton, MD, were the first Advisory Board of DRGO. The Claremont Institute, then under the leadership of Dr. Larry Arnn, took DRGO on as one of its special projects, and our work began in earnest. A sentinel event in the public health community’s anti-firearm civil rights campaign was the publication of Dr. Arthur Kellermann’s article in the October 7, 1993 issue of the prestigious New England Journal of Medicine titled “Gun Ownership as a Risk Factor for Homicide in the Home.” This flawed article by a crusading emergency room doctor was the most brazen attempt at advocacy science, clearly designed to tar American gun owners with the stigma of inner city violent criminals. Roundly discredited by distinguished academic criminologists, this article is still quoted endlessly by sympathetic media outlets and gun-grabbing politicians. DRGO’s work was cut out for us. Kellermann’s article and others like it in prominent medical journals became the ammunition for state and federal legislation mounted in the mid-1990s in a great new push for gun prohibition. Anti-gun rights politicians now had a powerful new weapon—research published in top-tier medical and public health journals—to push the false idea that guns were a public health problem. Dr. Wheeler testifying before the House Appropriations Subcommittee in 1996. 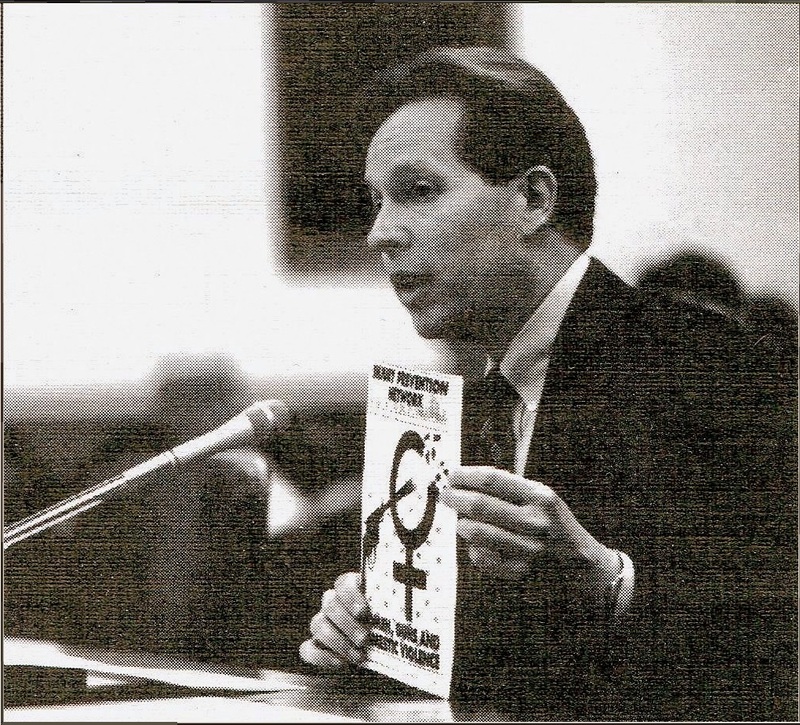 One of DRGO’s first battles was the introduction in 1994 of the Brady II bill, an attempt to vastly extend prohibitions on gun ownership by American citizens. Dr. Wheeler was invited to come to Washington to testify before the Senate Judiciary Committee on the issues involved. Our testimony, along with our answers to bill author Sen. Howard Metzenbaum’s hostile follow-up questions, pulled no punches in exposing the public health assault on gun owners. As gun prohibitionists in the medical academic world teamed up with the Clinton administration and major media to mount their public health assault on gun owners, the need for an articulate and rapid response was evident. Even as Brady II was in the works and finally defeated, the coalition was advancing its agenda through the Centers for Disease Control and Prevention (CDC). Until then, the CDC had been concerned with the prevention of infectious disease. It had acquired a well-deserved reputation as a government agency whose work saved lives. But starting in the 1990s certain officials within the CDC sought to expand its role to advance a political agenda of gun control. It was here that DRGO stepped in to very publicly expose this agenda, to turn Congress’s attention to it, and eventually to assist in stopping the use of taxpayer money to advance the gun prohibition agenda of a few CDC officials. The details of this fascinating chapter in DRGO’s history are covered in The History of Public Health Gun Control, a three-part history posted on our website. As we moved into the new millennium and the administration of George W. Bush, the public health gun prohibition movement lost steam. It found very few friends in the Bush administration and lost its momentum to harness the vast power of the executive branch bureaucracy to advance its agenda. Although DRGO continued placing opinion articles, appearing on national television, and developing membership, no major challenges confronted us in the policy arena. Still, the steady flow of anti-Second Amendment medical journal articles, conferences, and media coverage continued. After enduring the blatant gun control advocacy of Clinton Surgeons General Joycelyn Elders and David Satcher, we looked forward to George W. Bush’s new Surgeon General, Richard Carmona. Carmona was a combat-decorated veteran, a member of the close-knit community of tactical medicine doctors, and a real-life hero, having saved a woman’s life by risking his own, and shooting her attacker. But Carmona proved a disappointment, never mentioning gun ownership or civil rights during his tenure, much less supporting them. Things changed rapidly with the election of Barack Obama as president. Behind-the-scenes gun control pushes put on hold for years were given new life, the administrative machinery was geared up once again to pressure and harass gun owners, and Obama appointed one of his fervent campaign supporters, the openly hoplophobic Dr. Vivek Murthy, as Surgeon General. It was during the Obama years that DRGO concluded its long and fruitful relationship with the Claremont Institute and became a project of the Second Amendment Foundation (SAF). This change benefited all parties, since the SAF’s mission is concerned only with firearm civil rights. The Claremont Institute remains a steadfast friend of DRGO, with its Center for Constitutional Jurisprudence lawyers having represented DRGO on two amicus curiae briefs in federal court. Our leadership team has expanded to four medical doctors from states as diverse as New York, Texas, Iowa, and California. Our membership continues to grow. We draw on the world-class expertise of our members—highly trained physicians and surgeons, scientists, and allied health professionals with various firearm-related skills—to advise legislators, fellow health professionals, and the public on firearm issues. DRGO has professional relationships with the National Shooting Sports Foundation, the National Rifle Association’s Institute for Legislative Action, NRATV, the Claremont Institute, several state firearm rifle and pistol associations and state Second Amendment groups, print and electronic media, and of course the sponsorship of our umbrella organization, the Second Amendment Foundation. Thanks to a gradual but definite shift in public opinion favoring firearm civil rights, bolstered by federal court decisions, the Obama administration was unsuccessful in advancing its anti-firearm civil rights agenda to any meaningful degree. As the political pendulum has swung the other way, DRGO now looks forward to continuing our campaign against the public health gun prohibition movement, and for the right to keep and bear arms formalized in America’s Constitution.